Seeking company for my students to do design work for. I am seeking interesting new companies/businesses that are willing to work with a design student from Suffolk University. Science, not-for-profit or arts organization preferred. Interesting Means: a company selling or promoting a product or information that 18-20 year olds will be interested in. I.e., Space, Hip Hop, etc. related. • list of possible design projects - i.e. branding, app, ad, poster design, packaging, print, book, motion work such as title sequences, etc. Note: these projects will be for our spring semester so due dates should be after May 15. The Chandler Gallery invites artists to submit work inspired by mapping. Artists may interpret mapping in many ways and make work that is not necessarily literal but uses the idea of mapping metaphorically. Personal maps of mind, body, daily routine, experience and memories as well as maps of the city, sky, or ocean are all possibilities; any 2D or 3D techniques including works on paper, prints, drawings, photographs, collages, books, paintings, and sculpture are eligible. Open to artists in the greater Boston area. Chandler Gallery is inviting a curator or curators to propose a show for 2019 exhibition roaster. If the show is an open call to artists, the call must include a small fee of $15 paid to the gallery. Alternatively, curator/s can invite a group of artists whose work supports the theme of the show in which case no fee will be charged. Like us on Facebook for news and updates to our concert calendar. This Saturday, December 16th at 7 p.m.
Now in its eleventh year, the Good Cheer Fest is a celebration for the whole family. Carols, stories, and surprises are in store on Saturday, December 16 at the beautiful Clarendon Hill Presbyterian Church in Somerville, MA. There will be live jazz, cookies, cider, and nog, and lots of smiles. Come ready to sing, and please dress the part. Sweaters not mandatory but deeply encouraged. $10 suggested donation benefits the Somerville Homeless Coalition. Canned food donations accepted for the church. There will also be a sale of knitted and crocheted items in the gallery. From Davis Square take Bus 87 or 88 - Clarendon Hill. Exit at Broadway and Curtis St. and walk 3 (short) blocks north on Curtis Street. We are on the corner of Curtis Street and Powderhouse Blvd. Parking is available in the West Somerville Neighborhood School after 5:00 and on weekends. The parking lot is located on Raymond St. Turn a thet intersection of Powderhouse and Curtis onto Curtis, then take the first left onto Raymond St. The lot is located about 1 block down. Street parking is also available one block away on Packard Avenue from Powderhouse on the hill bordering the Tufts University campus. Please take note of all street signs relating to parking! Last week we held our Artist of the Month celebrating our 2017 folks. A grand time. It’s now time to get your help to nominate Somerville artists for our 2018 season. If you know of a special artist (meaning all genres of art not just visual art), please nominate them here Nomination process should only take a minute of time. We’ll be review the nominations over the next few weeks until mid-January. And a big shout out to Gilmore Tamny and Matt Kaliner for their work on this program in 2017 and continued work in 2018, with a new volunteer, Kerrie Kemperman. I’m reaching out because we are looking for teaching artists who would be interested in teaching a one-time two-hour Saturday arts workshop to youth between grades K-12. We’re looking for a diversity of activities and artists, and have partnered with artists who have engaged our community with photography, ceramics, beatboxing, printmaking, and more. This is a paid opportunity with provided materials and compensated preparation and planning time. More details and a workshop proposal can be found here at our Submittable posting. Would you be willing to share this posting with artists in your community who would be a good fit? Please feel free to let me know, or directly forward this information or my contact information to artists in Somerville. We would love to schedule some artists for the coming months soon. Please do not hesitate to let me know if you have any questions or recommendations, and thank you! Paul N. Roth is an improviser, composer, musicologist, writer, theorist, Roth works through a variety of means for the less-conventional, sometimes surprising declaration of sound and its organization in time, space, etc. His solo work in particular re-conceives accepted roles for the saxophone, disguising much of the instrument's long improvising history for an approach that is somehow unique and original. He has also more- recently directed his focus towards the personal, normal, and everyday - through an on-going series of audio books, text pieces, and radio works. Douglas-Moore & Roth's collaborative output may best be described as sonic adventures in a land of textural tamperings, microtonal manipulation, meandering sound walls, and other ear curiosities. Eric Hofbauer has been an integral member of Boston's jazz scene as a musician, bandleader, organizer and educator for the past twenty years. He has performed and recorded alongside such notable collaborators as Han Bennink, Roy Campbell, Jr., John Tchicai, Garrison Fewell, Cecil McBee, Steve Swell and Matt Wilson. Hofbauer is perhaps best known for his solo guitar work featured in a trilogy of solo guitar recordings (American Vanity, American Fear and American Grace). 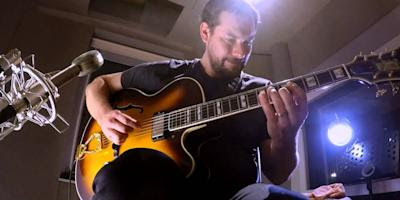 Of the trilogy, Andrew Gilbert of The Boston Globe writes, "No other guitarist in jazz has developed a solo approach as rigorous, evocative, and thoughtful as Hofbauer." Recorded live at Rotary Records by Warren Amerman. erichofbauer.com CNM 2016. Please join us for our annual El Sistema Somerville Winter Concert. Come and experience the power of daily music instruction. Our students appreciate your presence and support! Come out to celebrate our 2017 Artist of the Month. Please join us to celebrate these artists; enjoy some good cheer and comradery, short presentations, and free food. When: Thursday, Dec. 7th, 7 p.m. The Somerville Arts Council is pleased to announce the December Artist of the Month, Pier Gustafson.